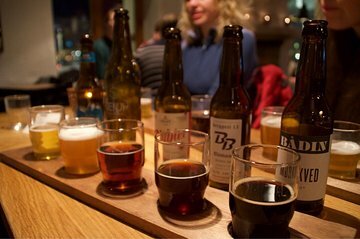 Pruebe las mejores cervezas artesanales de Tromsø con un recorrido de 3 horas de cerveza a las puertas del ártico. Explore la ciudad a pie mientras recorre la ruta a tres pubs y bares mágicos. Pruebe la cerveza local, conozca la tradición cervecera de Noruega, y deguste una clásica lager oscura de la fábrica de cerveza más septentrional. Pruebe diez cervezas junto con las "tapas árticas", como el carpaccio de reno o el salmón ahumado en frío, y obtenga una perspectiva privilegiada de los mejores lugares para comer y beber en el extremo norte de Noruega. Cerveza de 3 horas de duración de Tromsø. Explora la ciudad con un guía experimentado. Muestra cerveza local y aperitivos. Forma divertida de ver los lugares de interés. Went on safari on February 20th and I was the only one to turn up so I had the brilliant guide, Ben, to myself. He is a charming guide and really knows his stuff about brewing but we chatted about lots of other things to do with Norway which was great. The tour visited 3 venues starting with a really small micro brewery where four very different beers were sampled. Next came a visit to Olhallen, the pub with 67 beers on tap! I only tried one here though and then we went to Kjeller 5 which has an amazing range of beers as well as an extensive range of beer making ingredients and equipment. On to the last stop for a sample of five contrasting beers and very interesting tapas. I really enjoyed the experience of the beers, tapas and most of all the company of Ben who was so interesting - thanks Ben. Sehr informative Tour für Bierliebhaber hat viel Spaß gemacht!! Einen Stern muss ich trotzdem abziehen, weil lt. Beschreibung Teilnehmer unter 18 Jahre anstatt Bier hausgemachte Limos probieren können sollten. Meine Tochter bekam allerdings nur einmal eine hausgemachte Cola und ansonsten konnte sie nur zwischen normalen Softgetränken wählen, wie Sprite, Wasser oder Coca Cola. Das fand ich schade, da sie sich doch sehr auf die Kostproben gefreut hatte. Für sie hat es sich somit nicht gelohnt. Fun way to explore Tromso and meet fun people for an afternoon! The tour was fun and informative but the description made it sound as though we'd be receiving our own plate of tapas. Instead, we had to share with another tour guest. First world problems, I know, but it was very misleading. If you like beer, food and a bit of history then this is the tour for you. Our guide Bernard was very knowledgeable about both the local history of Tromso and the beers as well. We sampled many beers from the local region. A highlight was the Mack Brewery bar with 67 beers on tap unfortunately not enough time to sample them all. The food provided was also excellent. Would definitely recommend to anyone looking to do something a bit different in Tromso. It was fairly good value for money in Norway where everything is very pricey.